Before you say "yes" or "no", it's important to have the facts. Who is looking after the really valuable items -- your kids? 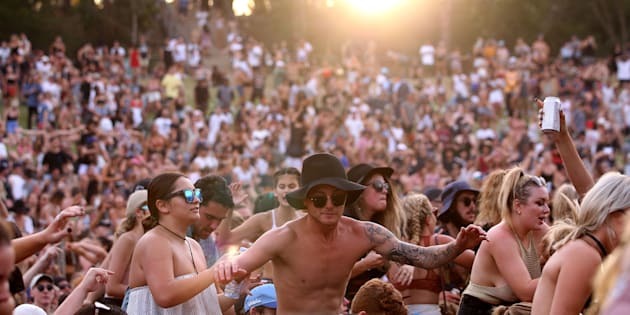 We are in the thick of festival season here in Australia and there are a lot of parents whose underage kids will be asking whether or not they can attend under 18 events or even open age weekend festivals. Having been on both sides of this fence, as a mother and as a risk and emergency consultant for most of the major music festivals and events around Australia, I thought it would be good to outline what parents should look for before saying yes or no, and possibly put some minds at ease. Getting to and from the festival is the first thing that comes to mind. How will they get there and back? This is a smart thing to organise prior to the festival. Have a look online with your kids to see where the best pick up and drop off areas are or, alternatively, if extra transport has been made available during the special event. The best managed large scale events will have predetermined drop off and collection areas, often away from the event site. Don't go thinking you can drop them off at the actual event as you will usually have to break the law with 'no stopping' signs around event sites or dangerous traffic conditions. Proximity to medical services is usually a major concern for parents. Although most festivals have medical tents, there are some organisers that do this better than others -- for the majority of festivals, facilities and safety comes first. Their strategy includes featuring a main medical tent to focus on bigger issues and then has additional first-aid posts around the grounds handling minor issues. For weekend festivals, it is a good idea to take/send along a first-aid kit with band aids so the medical tent doesn't become filled with patients who may have knocked off their band aid from the day before and are taking valuable time away from other, more serious, patients. A number of festivals and events now have volunteer services and groups such as 'Red Frogs', a peer-to-peer protection agency who are great to recommend your kids keep an eye out for if they ever need help. Exact food and drink availability isn't always visible on festival websites. If this is a concern for you, research to find out what your kids can and cannot take. Some festivals let you bring your own food so pack a lunch and put it in their backpack for the duration of the festival. Just make sure you check the entry conditions as this may not be allowed. The same goes for bringing your own water bottle or container. Some security may be instructed to pour out any liquid in an unsealed bottle so other 'refreshments' are not taken in. I'd recommend sealed containers for water or empty containers that can be filled from water fountains inside the venue. In terms of the attendees, it is always good to check whether an event is all ages or for under 18s. This will determine the likelihood of alcohol being around and accessible. The type of music is a solid example of the demographic and the type of event. If there are multiple stages, with different styles, there can sometimes be culture clashes. Look for events that have similar styles of music that your teens are listening to at home. There are many features now included that provide a safer environment. One is the installing of mobile phone charge stations, making contacting patrons more achievable. Another which has been around for a while is the use of lockers or cloak rooms. Day festivals utilise them more than two day or weekend festivals (where there is a certain level of assumed trust between patrons) to keep valuables safe. So, that is the valuables sorted, but who is looking after the really valuable items -- your kids? One thing many people might not know is there is always a control room in some shape or form. Even small/boutique festivals have a central location with event staff, security and police presence. A large festival control room would have representatives from all the key stakeholders including the event team, security, police, medical, cleaning, a transport representative and more. The control room can also manage a full suite of CCTV (security cameras) from around the festival site, to ensure your kids stay safe. It is a time to teach them about safety, responsibility, trust and how to reduce risk. Finally, the most important aspect when it comes to categorising safe festivals is to investigate how long the festival has been operating for and whether it has continually had incidents. If it has had incidents in the past and rectified them, then that is a great example of security, event and operation teams identifying the safest, risk-reduced options while still allowing attendees to have fun. If the incidents have kept occurring, it means the organisers have not learnt from their mistakes and have not found new ways to prevent incidents from occurring. An important aspect to remember is that if something serious occurs the final decisions are made by police, not the promoters or venue staff. When a venue is closed to due to unforeseeable incidents such as a severe storm it is the police who ultimately decide. How sites have executed emergency and risk plans is a demonstration of their ability to learn from their mistakes and also see how prepared they are to follow orders. When thinking about sending your kids to events this year or next, consider music festivals. They will dance, hang out with their friends and enjoy the amazing music scene that Australia greatly needs to support, especially now. It is a time to teach them about safety, responsibility, trust and how to reduce risk. You should feel comforted knowing that there are mums and dads working on the events, even behind the CCTV, looking out for them, keeping them safe.